A final few minutes of madness surrounded England's tense 12-11 win over South Africa in the opening match of their Autumn global campaign, with Owen Farrell's massive tackle heavily scrutinised in the wrap-up, dividing opinions of fans and players alike. England were the victors‚ South Africa were left wondering how the hell they had lost a game they had nearly won in every respect. "The most important thing is what we do next", Jones answered. Zach Mercer turned the ball over at the breakdown, allowing England to kick to touch and end the game. 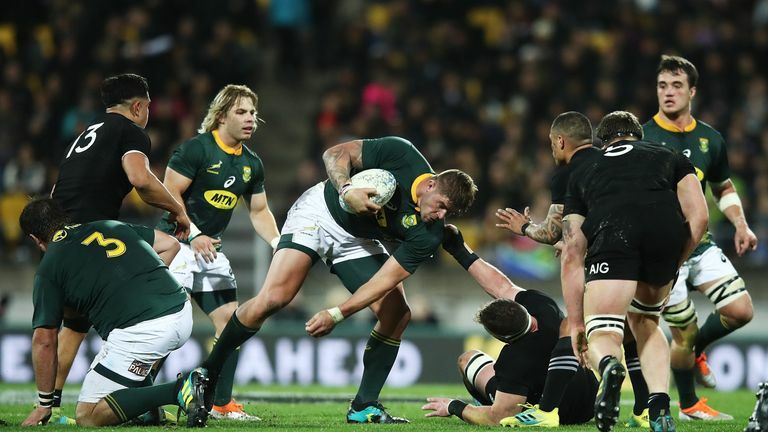 However, South Africa, who were without Sale Sharks' Faf de Klerk and Wasps' Willie le Roux, were on the front foot on the off and lead through Pollard's penalty. The All Blacks meanwhile, head to England on the back of another victorious Rugby Championship season, as well as having defeated Japan 69-31 with an inexperienced side. Handre Pollard had the chance to win it for South Africa late on but he pushed his effort and watched on as it kissed the right-hand post. They then conceded a penalty just inside their own half and Daly booted England into a remarkable 9-8 lead. But a shift has happened, a realisation that Farrell is indispensable to English fortunes and not just because he is nerveless in knocking over match-winning penalties and in demolishing a Springbok. The individual added to Gardner's entry by stating he was named Man-of-the-Match for "turning a blind eye to Owen Farrell's last-minute shoulder charge on Andre Esterhuizen". Speaking in Paris where South Africa are preparing to face France this weekend, Erasmus emphasised that although the decision could not be changed, consistency week in and week out was key.